Tabla - Dagga Set, Brass. Tabla semi professional quality, sheesham wood with heavy brass nickeled large Doogi, fitted with excellent hand made skins, special straps, nickeled tuning hammer, ring set and a standard transit hard board case. Brass Semi Professional Super Tabla Set of 2, tuning hammer - 1 pc, cushion set of 2, cover set of 2, semi hard case Bag.. Complete ready to play tabla set. 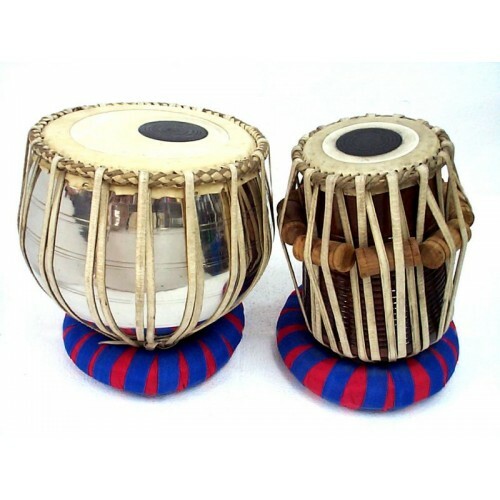 Dholak Indian Musical Instrument.Dholak Manufactured with Best quality Raw Material.Best In Quality ..
Ashton PSET 4 Percussion SetThe Ashton PSET4 Percussion Pack - A great way to teach children about r..